Free ebook from Amazon Kindle Prime. Totally free to download during these times. 1 Free promotions will start at approximately 12:00 AM Pacific Standard Time on the date specified. Depending on system latencies, it may take a few minutes to several hours for the free promotion to start. 2 Free promotions will end at approximately 11:59 PM Pacific Standard Time on the date specified. Depending on system latencies, it may take a few minutes to several hours for the free promotion to end. 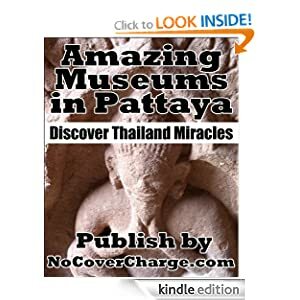 Most of these Museums in Pattaya are free but some Private once are charging a small fee. We have included a discount coupon in the book that will cover the cost for this eBook. Pattaya is such a wonderful place that some even say that it is indeed the best place on the planet. You can literally find everything in Pattaya and there is just tons of things to do if you would just take the time to go beyond the bar scene. I never see them promote the places where you can see ships, turtles and other marine animals and these costs only a fraction of the price of what you have to pay to see some lame show on Walking Street. Did you miss the free Download, get it free on Kindle prime at any time. We just checked and it was #2 on the download list for free Kindle books in Asia and that is great! wish I had a kindle...I also hear a lot of good recommendations for this book..